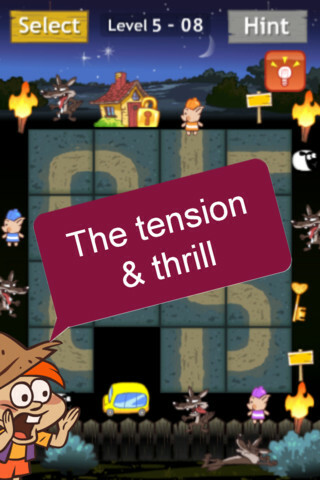 No Wolf is an iPhone game developed by Hyong-Jun Lee. This fun puzzler takes elements from classic fairy tales like “Little Red Riding Hood” and “The Three Little Pigs.” Your goal: slide puzzle tiles around to build a path to your house and escape from the Big Bad Wolf. The characters are cute, and the level designs are simple, yet classic. This is a great time waster for adults, or a fun way to get the kids to calm down for a bit and sit quietly. The graphics aren’t amazingly innovative, but they have their own charm. Some users might not like the tinny midi-quality rendition of the title screen song, which I’m pretty sure is supposed to be “Dixie,” a Confederate anthem. 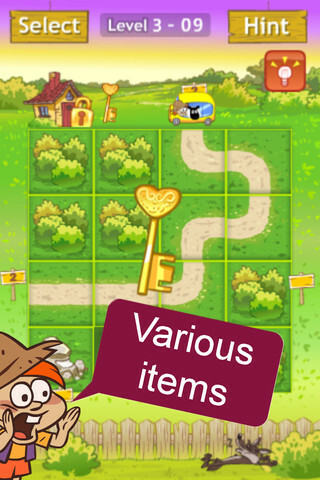 However, during the actual puzzle portion of the game, the background sound is the much less distracting sound of wild birds in the hedgerow. I do really like the way that you can shake the phone to reset a level. It brings back fond childhood memories of an Etch-a-Sketch. If you get really stuck, you can use one of your three hints that comes with the game, or purchase more hints in packs of 5 or 15. However, it’s worth noting that the hints aren’t based on your current tile formations. 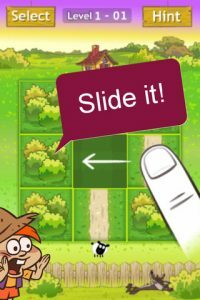 Getting a hint just means you’ll see what you finished path is supposed to look like. But for most players, that isn’t the problem: it’s how to get the tiles INTO that formation in the first place that is tricky. I think more people would enjoy this game if the hints system was more sophisticated. 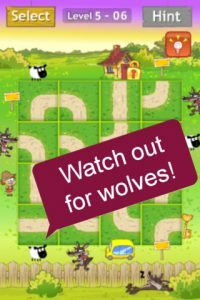 With 60 different puzzles to beat, No Wolf is a cute, classic approach to the puzzle tile genre of games. If you like puzzles, this free game is definitely worth checking out…especially given the fact that the developers plan to release more puzzles soon. 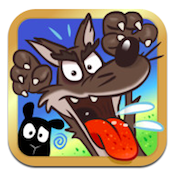 No Wolfis compatible with iPhone, iPod touch, and iPad. Requires iOS 4.3 or later.